This should be easy I thought. She had declined the breath test, but we were going to be able to see the squad car video of her performing the series of field sobriety tests. Long story short though, no one thought that she appeared obviously inebriated. Especially given the facts that she’d been up nearly twenty-four hours at the time of filming and that her last nimble moment had likely been more than several years prior. In the deliberation room a forewoman was quickly selected by reason of previous experience and, well, her ebullience. “it made me proud to be part of this system.” Her charge was to help us get to a unanimous position “beyond a reasonable doubt” regarding the defendant’s sobriety or lack thereof. There was considerable back and forth, give and take. First vote was six to six. The basic contention was between those who felt that with the first gulp of the first Blue Moon the defendant was “under the influence” and those with a need to be convinced that to be guilty the young woman’s blood alcohol content had been close to or in excess of the state’s limit of .08%. Some never spoke, some (such as me) offered pithy words of wisdom (“they have car wrecks in Utah”) and some regaled the groups with extensive tales of familial yore. All conversation, but for one brief exchange, was reasoned, polite, and earnest. After another vote, we had become eight with reasonable doubt of insobriety and four with none. By 5:00PM there had been much repetition and no more changes of mind. Clerk came with judge’s instructions to go home, not discuss (not even with wife or dog – I asked), and return at 9:30 AM the following morning. 9:30 to noon more of the same. 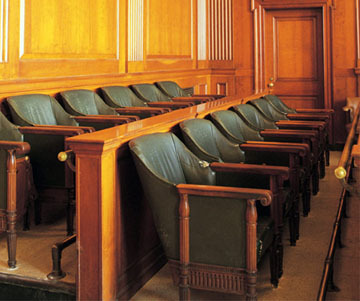 We were summoned into the courtroom where sat the judge and stood the lawyers and defendant. Told of no progress, the judge asked us to return to the jury room, reread his instructions, and wait for the pizza he’d ordered for us. By this time we were all sort of friends and enjoyed good natured probing for weakness in the other side’s line of reasoning. We all wondered why neither side had procured witness from the bar. It was apparent that had some disinterested sworn soul have told us that defendant either had indeed imbibed only the two beers over the course of the two hours or in fact had had more, deliberation would have ended with first vote. Absent that, the group could not be convinced, beyond a reasonable doubt, that defendant was guilty of more than falling asleep at the wheel. Or that she’d been drunk. Hung. Afterwards, Judge told us that the case would never have come before a jury had not both sides good reason to be hopeful of holding sway. That from his preview a decisive first vote seemed highly unlikely. And that fully a third of the proceedings over which he’d presided had ended with a hung jury. I was amazed. And impressed that some combination of fatigue, boredom, and callousness hadn’t yielded a more decisive denouement. *I am thrilled that there was not more here at risk – for anyone. **I cannot but wonder about the numbers of incarcerated innocent and those guilty wandering about carefree. *** We were each paid $70.00 for the experience. This entry was posted on April 6, 2013 at 12:26 am and is filed under Uncategorized. You can follow any responses to this entry through the RSS 2.0 feed. You can leave a response, or trackback from your own site.